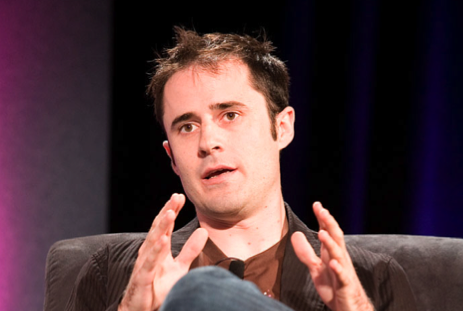 At its core, Twitter is a “recipient-driven medium,” said CEO Evan Williams in a public conversation tonight in San Francisco, Calif. What does that mean? Williams, an unusually theoretical CEO, is happy to explain. He spoke at a high level about the ideas that drive his company (which is now up to 145 million users). Williams contended that the medium of Twitter is (gasp!) actually well-suited to handle information overload. Williams, on stage at a Girls in Tech event at Kicklabs, compared Twitter to email, where information overload can be incapacitating. “The problem with email is that it’s sender-driven, and sender-driven media doesn’t scale,” he said. On the one hand, the recipient hates email for being spammy because “the sender is motivated to send as much stuff as possible because it’s free.” On the other hand, the sender may be dissatisfied because she’s not reaching the right audience for whom she may not even have email addresses. Blogging (Williams was previously the founder of Blogger) and Tweeting can be different (and better) than email, he said, because people who have something to say can find their audience. That’s a much better situation for both the publisher of the information and the consumer of it. So recipient-based media can scale better “in a world of infinite information,” he said. “Google is very good at ‘I need to solve a problem, I need to buy something, I need an answer,” he said. “Twitter is more ‘I’m interested in many things, I don’t know what I need to know. '” Where Google is more likely to be gamed by a company like Demand Media, Twitter is a different beast. Williams also said to expect forthcoming products that would help filter relevant tweets around events, similar to what Twitter is doing with location. This would go beyond the user-developed convention of hashtags, he said, though he didn’t elaborate. FitBit is backed by True Ventures, a venture capital firm that is an investor in the parent company of this blog, Giga Omni Media. Om Malik, founder of Giga Omni Media, is also a venture partner at True. Photo credit: James Duncan Davidson/O’Reilly Media, Inc.
Twitter is now the 3rd largest social site. Who ever knew it would get this big. Soon ebay will be buying it or google will buy it. Most mass market users don’t know how make twitter useful for themselves as individuals i.e. > Filtering, customization and creating value for themselves. I for one would pay a nominal fee for professional filtering of information based on my needs for relevant information. Then hurry up and pulled the trigger on Twitter Annotations ( WTF is taking so long anyway? ). Combined, the next generation third party eco system will rise up quickly, one centered around context ( opposed to the current gen which just delivers tweet verbatim ). My immediate thought in response to this comment is… Mailing Lists, Newsletters, Email Marketing. And, Email is properly Distributed and Federated Technology built on Open Standards and not controlled by a single corporation. Also, arguably it is not feasible/possible to scale as a centralized service for a billion+ people. Additional thoughts…. Twitter is already mostly consisted of what most consider to be SPAM. If you were to look at a Pie, the SPAM slice would be the largest along with Automated Cross-Posted Content derived from RSS/Atom Feeds. I like Twitter and believe it has value and think that it can continue to be a critical Utility of the Internet. But it is important to understand all the issues and be careful about making sugar-coated comparisons with Champion technologies (Email). Good points, sull. That’s a valid distinction about email versus Twitter — but blogs are not controlled by a single corporation either. Also, (to extrapolate a tiny bit) Twitter may have a lot of spam but hopefully in a well-filtered world a lot of it doesn’t get to you in the course of consumption. True that may be. Though again I have to mention that this is why mailing lists exist. But in regards to blogging, I see this to be an almost identical obstacle for the publisher and consumer. If I setup a blog, it does not come with a built-in audience and their is no guarantee that it will ever gain an audience. Millions of blogs come and go. Some frustrated bloggers stop writing when they don’t have a sense of social engagement or sense a lack of interest etc etc. Another technical point is how Email is used to publish content to blogs – see Posterous.com and basically every single social blogging/networking site offers Email publishing as an option.